While the new Zeiss Otus 28mm f/1.4 seems like a wonderful chunk of glass for those who do not mind a 1.35 kg beast, Sigma has just released its new 20mm f/1.4 Art-series lens, which is a much wider lens, while being as fast as the Otus. In fact, Sigma claims this one to be another “world’s first” as far as the focal length and the aperture – the next fastest lens is the Nikkor 20mm f/1.8G. With its MSRP of $899, the Sigma 20mm f/1.4 Art is only $100 more than Nikon’s excellent 20mm f/1.8G, so the big question is, is 2/3 of a stop worth the $100 premium Sigma is asking for? Well, the answer to that question is not so simple, because there is a lot more than just stops involved here. Sigma’s 20mm f/1.4 Art is completely different optically compared to the Nikon. First of all, we are dealing with a lens that has more superior optical glass inside, with 5 low-dispersion, two ultra low-dispersion and two aspherical lenses. One of those aspherical elements is particularly difficult to make, because it is a “double” aspherical lens with a large 59mm diameter. Essentially this element was the reason that Sigma was able to produce a 20mm f/1.4 – something no other manufacturer was able to achieve to date. So in a way, we can consider the Sigma 20mm f/1.4 to be in a different class of its own when compared to the Nikkor 20mm f/1.8G. However, there is one major pitfall – due to the large element on the front of the lens, it cannot take any regular screw-on filters! While another Sigma Art lens is welcome, lack of ability to take filters is the Sigma 20mm f/1.4’s Achilles heel! While many photographers don’t use filters and won’t particularly care, landscape and architecture photographers will surely consider this a deal breaker, as they rely on filters all the time. I personally would choose the Nikkor 20mm f/1.8G over the Sigma for this reason alone, as I rely on filters all the time. One could argue that filters at such wide focal lengths are unnecessary, but I strongly disagree. Shoot a large waterfall at close proximity without a polarizing filter, or a seascape without an ND filter and you will see that your setup will be limiting. While I am sure such options as the Wonderpana will make adapters available soon, the idea of lugging a huge and heavy filter system is not very appealing to me. Now one particular use for this lens would be astrophotography, but only if the lens can handle coma well. If it does, it will be a popular choice among astrophotographers. If it doesn’t, then the Nikkor 20mm f/1.8G will be its fiercest enemy… Time will tell. RONKONKOMA, NY – October 16, 2015 – Sigma Corporation of America, a leading DSLR lens and camera manufacturer, is setting new benchmarks for wide-angle image quality with the announcement of the newest Global Vision and market’s first full-frame 20mm F1.4 lens, the Sigma 20mm F1.4 DG HSM Art lens. The lens will be on display at PhotoPlus International Conference + Expo in New York City from October 22-24. The lens will become available late November for the street price of $899, and will be available in Sigma, Canon and Nikon mounts. 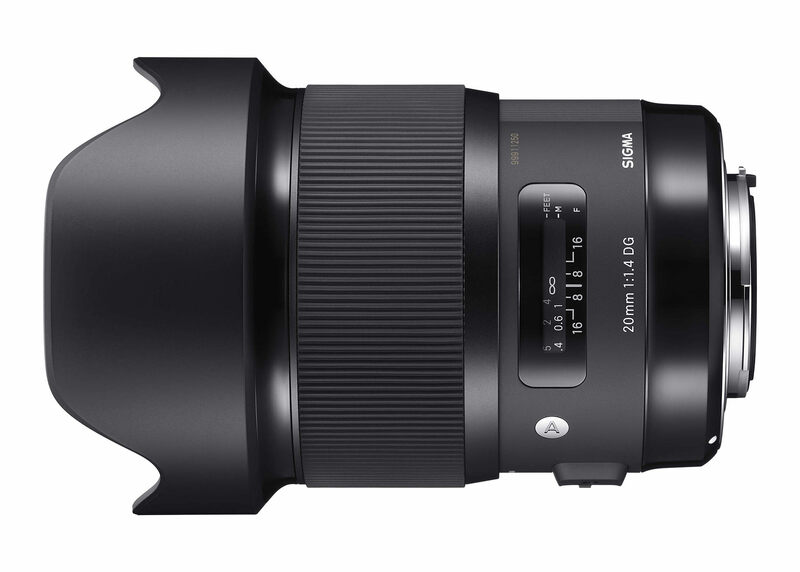 Sigma fans can feel confident knowing that every 20mm lens that leaves Japan’s factory has been tested using Sigma’s own modulation transfer function (MTF) measuring system, “A1.” Other prime lenses in the Art line include: 24mm F1.4 DG HSM, 30mm F1.4 DC HSM, 35mm F1.4 DG HSM, and 50mm F1.4 DG HSM. Well, I do like to use ND and polarizers but on ultra-wide polarizers have an uneven distribution of the effect and as a result, you have “blue spots” in the image. I stoipped using polarizers on UW’s some time ago. I will miss the ND’s but again not so much. It is likely that anything developed for the lens like Wonderpanna would only require more parts and pieces to bring, lose or break. I use the Nikon 16-35 f/4. I also have the Nikon 14-24 which is an exceptional piece of work. But the 16-35 uses a 77 mm filters and ND that are can be used on so many other Nikon lenses including the 80-400. That ability alone is so import from an equipment stand point. Why do need fast glass at all on an ultra-wide? I am using this lens to shoot landscape. I am on a tripod and using between f/7 and 8 to 11 and 16 (max). And if not always a long exposure. At 1.4 the DOF is very narrow and you would have to be careful in selecting the hyper-focal distance to get sharpness through out the frame. The 9 rounded diaphragm blades should get you a nice bokeh. As for the construction, it is mostly plastic. Sigma indicates that the “composite” material holds up well to temperatures but plastic or composite never holds up well over time against metal/brass. I am not sure what kinds of coatings Sigma is using but they can reduce aberration. flares, etc. I am familiar with Nikon’s coatings and trust them. I don’t know sigma well enough to make that comparison. I would have to wait for DxO to do analysis. As for their focusing motor, I am not sure how well that performs but that is not so much a worry as when shooting wildlife or sports. This is a landscape lens while AF is important, sharpness, aberration and distortion is critical. I don’t really think this lens will work for you based on your needs. It won’t work for me either because I need to use polarizers. That said, the Sigma lenses I’ve purchased over the past few years (18-35 1.8, 50mm 1.4 Art, 17-70 f2.8-4.0 C) and see little difference in focus speed or build quality vs Nikon equivalents. Nikon will hold its value better for resale, but for actual use, the Sigma’s are optically as good or better (example is 50mm art vs Nikon 1.4g), so for future purchases I now look at Sigma and Nikon as roughly equivalent and then choose based on which specific lens fits best. Well for me landscape equal Lee 100mm filter system so it might be a great performer but I won’t get it because it doesn’t work with it. I already have a 14mm rokinon and a 35mm sigma art. Between the nikon 20 and 24mm 1.8 g, which one would you choose for landscape to fill the gap I have? Looking forward to seeing how coma on stars is with this lens wide open. I own the Nikon 20mm and I love this lens. It is crazy sharp, produces nice sun stars in back lit situations and it is small and lightweight. Not a single hear on my head would consider to ditch it for the Sigma version. If I would need to buy a 20 mm all over again, I would choose the Nikon again without a hesitation. It is a lens that provides a lot of value for the money. Coma is the #1 problem for these focal length lenses in general. A good test is to use high contrast light source like an LED light and see if coma appears when you aim off axis. If so you may have problems in the field with long exposures and off axis light sources. The falloff graph Sigma has posted for this lens does not bode well for astro work actually. It’s like 2 stops down at the edges. By the time you compensate for that the noise levels will be through the roof, and image stacking will have uneven results. I guess we’ll have to wait and see, but overall I think it’s a nice notch for Sigma. They’re still impressing. That fall off at the edges is the difference in quality. When people rave about a lens and do comparisons it is usually at the center. No one considers edge to edge, or all the other values. In fact most just view output on an LCD screen as opposed to a hi-res and large print. I have heard some discount the quality values and just say, you’re paying the higher prices for market costs. When your lens leaks moisture into your camera because it lacks weather sealing, your savings just went out the door. It often amazes me that many reviews are not done in the field under challenging and actual light conditions. Just like the new series of 150-600 lenses that at mid-day in bright light work well but come evening or early morning the f/5-63 becomes an issue for focusing, shutter speed and need for higher ISO. I just got the Nikkor 20mm f/1.8G, and I did try out the 20mm and 35mm Sigma. The Nikon has a rubber ring on it’s mount to stop water from leaking into your Nikon camera, you can also add filters which you can not do on the Sigma. That look of the Nikkor 20mm f/1.8G was just outstanding and it fit my landscape world perfectly. Recently, I have bought this lens on the advice of my friend. He has a solution for filter problem by cutting 2 parts (longest parts) of the hood, then we can use the filters 100x150mm we had before with 100mm system Holder Nisi V5.